Waveski surfing in South Africa started seriously in the late 1970s. Early pictures of waveskis date back as far as the 1930s, however and paddle-surfing goes back as far as kayaks - which is a long time. Waveski is an exciting and dynamic paddle-surf discipline. The waveskier is seated on a foam and fibreglass surfboard shaped board with a seat and footstraps. Like a whitewater kayaker the waveskier needs to be attached to the board to perform dynamic manoeuvres. This is accomplished by a “seatbelt” with a quick release. Like a kayak the waveski is righted by “rolling” it back upright with the paddle. Like board-surfing, a good waveskier requires good water confidence and a good level of fitness, with exercise coming in powerful short bursts. A good waveski surfer can be equally as exciting to watch as a surfboard rider as he carves the wave throwing plumes of spray, smashes up through the lip of the wave into an aerial that can be as high as two metres above the wave or tucks into a translucent green barrel. With waveski clubs active all along the long coastline of South Africa, there is a wealth of experience and guidance available to those interested in learning more. Cape Town, Port Elizabeth, East London and Durban are all homes to a club. 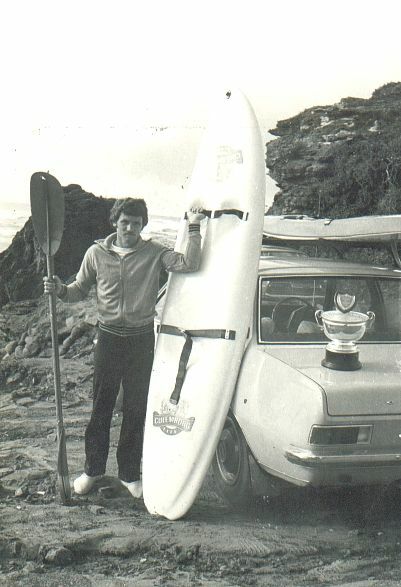 For those who enjoy pitting their bodies and skills against both the ocean and their fellow waveskiers, each club runs a series of competitions. The pinnacle of waveski achievement is to represent South Africa at the World Waveski Championships every second year. 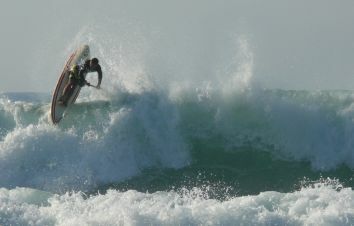 SA Wave ski is internationally strong and has produced numerous World Champions (both male and female). Linking to CSA gives Waveski the national and international clout that the sport needs to continue with its growth. To be selected you must first pass through the crucible of the SA Waveski Championships, where competition is fierce as waveski surfers from all over SA come together once a year to fight for top placings and club honours. Waveskiers are often great watermen and may also compete in kayak/surfski events and other watersports so have a lot in common with the other paddle disciplines. Waveskiers in SA range from young (teens) to old (60s). Waveski, like white-water kayaking adds a dimension of skill and adrenalin that may appeal to those who want to cross-over from surfski, and although similar to surf-kayaking, is inherently faster and more dynamic. A waveski is fun at whatever level you choose to paddle. We have club members with heart problems or heart bypasses staying fit and enjoying it. Lower limb amputees have in the past competed at top levels, and there have even been single hand amputees and people with severe hand injuries who have found ways to hold a paddle.